So, the dust has settled, the paint has dried. I’m not even doing a double take anymore every time I open up this page and see all these unfamiliar shapes and patterns. I must say, I’m very glad that you (well, most of you 🙂 welcomed the change so enthusiastically. Can you believe I very nearly couldn’t bring myself to go through with it? I kept thinking that if I wake up one morning a few months from now and can’t stand it, it’ll look awfully silly to change back. But I guess it’s kind of like moving to a new house – as much as you might think you’ll never love these walls and carpets as much as the last ones, eventually they do start to feel like home. But that’s quite enough about blog design, isn’t it? It’s time to get back to food! And today I’m finally getting around to giving you the recipe for one of the best things we ate during our recent trip to Croatia. Before we get down to the nitty-gritty, though, I have to be honest about something – in a perfect world this isn’t quite the recipe I would be bringing you. In that world I would be bringing you the recipe for something similar that qualified as one of the top ten things I’ve ever eaten. The fact of the matter is, though, that I can’t very well give you a recipe for something I’ve never managed to successfully make myself, can I? Of course not. But I can tell you about it. While we were in Croatia, there was one meal we really wanted to be special. On the second to last night we were going to be celebrating our tenth anniversary (not our wedding anniversary, I should clarify, but the anniversary of that rainy day we met on a cliff-top in Ireland) and naturally we wanted to splurge a bit. We were in Vis, and so it was a no-brainer to go to a seafood restaurant called Pojoda which had came highly recommended to us by three different sources – our guidebook, the owner of the apartment we rented there, and our friends who had been sailing in Croatia recently. I don’t think I’d ever had a single restaurant recommended to me that many times, so it seemed like a safe bet. Unfortunately, though, we weren’t the only ones to have been given this hot tip. When we arrived on the special day at 8:30 sans reservation we found the place bursting at the seams with about eighty loud, inebriated Austrians who had invaded the sleepy town to race in a regatta the next day. "Come back in an hour and I might find you something," a harassed-looking waiter told us, practically shouting to be heard above a chorus of drunken singing. Manuel was convinced we should go somewhere else (which is pretty much his standard response where drunk Austrians are concerned), but I stuck to my guns; I was convinced we would regret it if we did. So we returned in an hour and the same waiter, seeing our look of despair when we realized the sailors hadn’t even finished their main courses yet, cleared off a small service table near the door and told us that if we didn’t mind the draft we could eat there. So hungry we probably would have sat on the floor if asked, we agreed. Everyone had instructed us to order Pojoda’s grilled fish – some of the best in Croatia, we were told – which we did, choosing our own gleaming (and expensive) specimens from a large platter overflowing with bream, grouper and bass. For our first courses the restaurant offered a range of Italian-style primi piatti to choose from, so I asked for a bowl of of spaghetti frutti di mare and Manuel got the risotto nero, which, for the record, he only reluctantly agreed to after I convinced him we shouldn’t both order the same thing. I’ll tell you now, the fish was really good. It was crisp in all the right places, moist in the rest, and couldn’t have tasted sweeter and fresher if they had gone out to catch it while we waited. If you’ve never sat a few yards from the sea and eaten a whole fresh fish rubbed with olive oil, salt and garlic and quickly grilled over a live wood fire, you’re missing one of life’s great pleasures. At any other restaurant, at any other time, it would have made for a supremely memorable meal, the kind of meal we might recall fondly a few years down the line, not remembering the exact flavors but just the feeling of wholesomeness that lingers after enjoying such simple, beautiful food. Unfortunately at this meal it was a huge letdown. But then, whatever followed that spaghetti would have been. I can tell you what was in it, but I don’t think I can adequately convey just how good it was. That tangle of chewy pasta, tangy with wine, slick with olive oil and hiding a treasure trove of langoustines and briny, tightly-curled shrimp in its folds, was not only in a class by itself, but an entire galaxy. It was salty and garlicky and tasted like I would imagine seafood-flavored crack might taste, if they ever invented such a thing. It was nothing extravagant, nothing novel or daring – it was just perfect in every way. I sat there dumbfounded, almost unable to speak, suddenly oblivious to the draft from the door and the roar of the drunk sailors in the room behind us – and, for that matter, my poor sulking husband, whose risotto tasted like chalk by comparison and who has still not forgiven me for talking him into ordering it. I wish I could give you a recipe for that pasta. I even questioned the waiter for ten minutes when he came to collect my licked-clean bowl, just to make sure I had correctly deciphered what was in it. The ingredients were obvious, in fact – pasta, garlic, wine, oil, a variety of whole, unpeeled shellfish – but the truth is I still don’t know what made it so delicious. Perhaps it was the sweet, fresh langoustines pulled from those clean Adriatic waters that morning; perhaps it was the skill of the chef who learned the art of perfect pasta from his Italian grandmother. Or perhaps it was just a fluke, a happy accident that even the same cook with the same ingredients wouldn’t be able to reproduce again. All I know is that it was something I couldn’t even come close to replicating when I gave it a shot in my own kitchen a week or so later, either the first, second or third time I tried. So I offer you this recipe instead. It was another fabulous, simple shellfish dish we ate in Croatia, a pungent, messy pile of langoustines (or prawns), garlic, tomatoes and wine that simply begs for you to dig in with your bare hands and enjoy with unbridled gusto. It admittedly didn’t have quite the effect on me that the seafood spaghetti did, but by any other yardstick it would have been one of the highlights of our trip. And even taking that mythical spaghetti into account, I’d go so far as to say that a bowl of seafood doesn’t get much better than this… even if by objective counts it did only take second place. Despite the Italian-sounding name of this dish, it is apparently a native Croatian preparation. 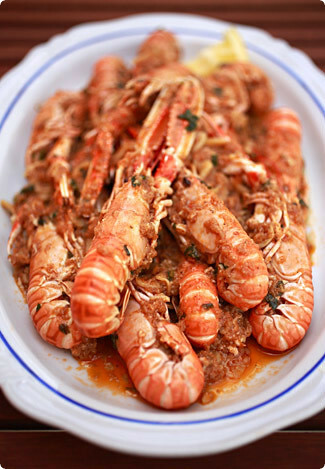 Succulent, shell-on langoustines quickly simmered in a heady mixture of olive oil, garlic, wine, tomatoes and breadcrumbs is a ubiquitous dish along the country’s whole Adriatic coast, and ranged from good to excellent everywhere we tried it. While it’s pretty straightforward to make at home, there is one thing that is crucial to its success. Whatever you do, please don’t even think about substituting pre-peeled shrimp for the head-on scampi or prawns in this recipe – the depth of flavor will be nowhere near what it should be. If you can’t find whole head-on shellfish, come back to this recipe when you can. Heat the oil in a large skillet over medium-high heat and fry the breadcrumbs until they start to turn golden brown. Add the garlic, parsley, and tomatoes and fry 3-4 minutes more. Add the wine, salt and pepper and bring the mixture to a boil. Add the scampi, cover and cook, tossing them frequently to insure everything is well coated with sauce, until they’ve all turned pink and the sauce has slightly thickened, about 10 more minutes. Correct the seasoning, if necessary. Serve in deep bowls with lemon wedges, plenty of bread to mop up the sauce, and napkins. Delicious sounding recipe but the story and the writing really takes the cake. It’s so enjoyable to read about the entire experience as you tell it! Love the new blog design. The Scampi looks yummy too! OK, I have a theory. It had to be some kind of shell-fish stock in that spaghetti dish, reduced way down. Could either be langoustine/shrimp shells alone, or something "extra". I’ve been reading more about umami recently, and I wouldn’t be half surprised if there were some dried seafood/seaweed in the stock also. It might be a place to start.Also, maybe try vermouth in place of wine? Some of my greek recipes just would not work with normal whites, because they were missing that retsina tang. I have really enjoyed reading about your trip to Croatia. It reminds me of my recent trip to Italy and all the wonderful things I experienced there. I had the best ever pasta dish of my life there and when I asked about, they told me it was just fresh tomatoes, garlic, herbs scampi and anchovies. I honestly think it was the salty, briny anchovies that put it over the top. That, and the copious amounts of delicious olive oil they used to bring it all together. Well, i will never take a trip like that (I have only been in Brooklyn and Clearwater Florida), but i love reading about your travels.By the way, scampi is delicious. I have only had it once (I am 50 years old) but my boyfriend "Big Bear" catches mudbugs in the swamp behind the trailer park. I’ve been searching for head-on or really any langoustines in my area (Philadelphia) forever with no luck. This recipe is such a tease!Maybe I’ll just have to make due with head-on shrimp in the interim. Love the new design. You know, I’ve never made scampi but I thought it was usually made with butter? Was I deluding myself? Yours looks outrageously delicious. This recipe looks great! I love that it’s a Croatian dish. I’m going to prepare this tomorrow! It must be something about spring – I now have a new look too, and even a new blog address! I so understand what you mean about sometimes not knowing what makes a dish so delicious. It probably comes down to the quality of the ingredients most of the time, and clever use of seasoning. Wonderful, wonderful post. I spent only three days in Croatia but I ate pretty much the same thing, lunch and dinner, all three days: grilled fish, grilled shellfish and a bit of pasta. Always very simple preparations; always delicious. Thanks, guys! !Charlotte – I think you might be on to something. It recently occurred to me too that there might have been some concentrated shellfish stock lurking in there somewhere, so that’s next on my list of things to try!Tea and Maninas – I really should clarify that the black risotto was not bad at all. In fact, it was quite delicious – it was just the spaghetti that raised the bar too high, I’m afraid. I know it normally doesn’t taste anything like chalk. :)p.s. And you’re so right about the flavor of the seafood itself being crucial – sometimes I want to cry at how tasteless the stuff here is… dp – Ah, those Italians. They could pull a moldy old sock out of the garbage and it would still taste good. Okay, maybe I’m exaggerating a bit, but you know what I mean!Kyla – Actually ‘scampi’ is just the Italian name for langoustines. I think what you’re thinking of is an American dish called ‘shrimp scampi’ which is jumbo shrimp sauteed in butter, garlic and wine…right?Katie – Hmmm, how to sum up life in Scotland? Let’s just say if you like whisky, rain and damp, crumbling castles you’d be in heaven. 🙂 Lucy – So… did you make it? ;)Rosa – Love the new design too! There must be something in the air this spring… Aun – Nice to see you! And you know, you should talk – I think you’d make a pretty penny with a tour business of your own… :)Casey – Thank you! I always find visits to places like Croatia inspiring because they remind me complex doesn’t always mean better (in fact it rarely does!). It’s a mantra I should have tatooed on my forearm so I never forget! wow! this recipe sounds delicious i will have to try it sometime! i read your blog all the time, but ive just recently discovered the comment thing, silly me! i have my own Home Cooked Dinners Pickering site if you are interested… even if not! i love your idea of this blog! keep up the amazing work!